Nefertiti, Queen of Egypt, wife of King Akhenaton, high priestess of the god Aton, beloved of her people, and arguably one of the most beautiful women from Egypt, ancient or modern. Alas, I knew little about this fascinating historical character until I was into my early teens. My early school education in history did not even hint at the existence of the richly interesting heritage of the Egyptians. In fact, I’m sad to say that the first time I even encountered the name “Nefertiti,” was not in the context of a noble queen of antiquity, but as the name of a pet dolphin. I used to unfailingly read the Phantom comic strip (by Lee Falk) in the Sunday papers when I was a child, and the Phantom had these two pet dolphins named Solomon and Nefertiti on his Isle of Eden. I knew the name “Solomon,” of course, being familiar with the Biblical story of King Solomon, but the name “Nefertiti” seemed so exotic and intriguing. Of course, not knowing any better, I was convinced at the time that this was just something that Lee Falk had made up. It was only later when I got into high school, that I became fascinated by ancient Egypt, spending hours poring through the pages of the Encyclopedia Britannica in the school library (back in the days when all knowledge wasn’t accessed through a few keystrokes in a Google window). And along with Cleopatra and Tutankhamen, Nefertiti featured prominently in those glorious afternoons spent with my nose buried in musty pages in a poorly lit reading room. Just the fact that Nefertiti’s story dated back to the 14th century BCE was fascinating in itself, trying to envision her life and times from over 3300 years ago. The bare facts of Nefertiti’s life are well established by Egyptologists. She was a child of nobility and had a younger sister named Mutnodjmet. She married King Amenhotep IV, with whom she bore 6 daughters. In the 5th year of his reign, Amenhotep IV changed his name to Akhenaton, and established a new monotheistic religion focused on the sun-god Aton, effectively dismantling the existing polytheistic religion of the time. This resulted in a prominent role for Nefertiti – she became part of a divine triad as a high priestess of the religion, along with her husband, and the god Aton. It’s not long after that when all the mystery starts. In the 12th year of Akhenaton’s reign, one of their six princesses died, three disappeared, and Nefertiti vanished. There is no record of her death, and no evidence that she is buried in Akhenaton’s royal tomb. What a fertile landscape this opens up for writers of historical fiction, to let their imaginations roam free. And a few noted authors in this genre have done exactly that. Michelle Moran (whom readers of our blog may have met in the preface to Pompeii – A Day of Fire) has explored the history and the mystery of this tantalizing figure in her novel Nefertiti, creating a compelling character at the center of a plot filled with political wrangling, religious unrest, complex relationships, love, loyalty, betrayal and death. With so many unanswered questions surrounding her life, disappearance and death, it’s no wonder that her story has provided fodder for historical detective fiction as well. Both Nick Drake in Nefertiti, The Book of the Dead, and Lynda Robinson in her trilogy on the queen (Eater of Souls, Drinker of Blood, and Slayer of Gods), have their fictional detectives search for answers to these questions. Nick Drake’s detective is Rahotep, a young sleuth in Akhenaton’s service, who is given a life or death assignment to find the queen in ten days. Lynda Robinson’s protagonist is set in the time of Akhenaton’s successor, who is none other than the boy king, Tutankhamun. As Tutankhamun’s eyes and ears, Lord Meren is charged with investigating Nefertiti’s suspicious disappearance and death. And finally, with so much going on in one particular slice of Egyptian time, it’s no surprise that Egyptologists have been very much in on the act (modern Egyptology has been around as an established field of study since about the 18th century). Theories abound on Nefertiti’s demise and the location of her final remains – some supported by fact, some by circumstantial (and in some cases, circular) evidence. And the 1912 discovery of her bust in the ruins of the workshop of the ancient sculptor Thutmose in Amarna reignited interest in Nefertiti’s mysterious disappearance. 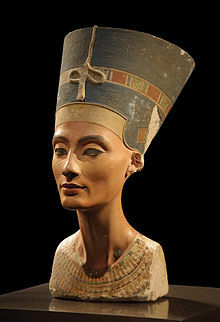 Since Nefertiti’s body has never been discovered, even after the explosion of information available following the discovery of Tutankhamun’s tomb, much attention has focused on alternative locations of her tomb next to known royal resting places. Here’s a recent article on one such hypothesis. In the meantime, until some definitive evidence emerges, we have to content ourselves with imagining all the different ways in which the gaps in Nefertiti’s history can be explained. And isn’t that what mystery in history is all about? Happy reading, and happy mystery hunting, everyone!